Hi Guys, when you buy any latest technology Android smartphone you have lot of excitement about your latest smartphone. Each and every one who bring new smartphone want to check all features, pre-installed apps, settings and many more. Today we discuss how to remove or disable bloatware on Android device. But before discuss the process how to remove or disable bloatware on Android devices you must know about it. There are lot of pre-installed apps comes with your Android smartphone, these apps are known as bloatware. We have lot of craze of these pre-installed apps for couple of days. After sometime our excitement got disappear due to consume lot of storage space, system resources, RAM by these pre-installed apps. These pre-installed apps are also known as bloatware. There are few bloatware, in other words pre-installed apps or software are useful and remain are useless. These bloatware running in the background of your Android phone and draining up your phone battery. You have the control to easily remove or disable bloatware on Android device. How to remove or disable bloatware on Android device? Step 1: Tap on the “Settings” in your Android device. Step 2: Scroll down and search “Apps” option. Now, tap on the “Apps” option. You will see there are different sections like Downloaded, On SD Card, Running, All, Disabled. Step 3: If you want to remove or disable bloatware on Android device then tap on the pre-installed app. Step 4: There are lot of options you will get in App info like Force Stop, Uninstall Updates, Disable, Clear Data and Clear Cache. Force Step: This option is used to immediately stop the running process of active app on your Android device. Uninstall Updates: If you don’t want to keep updates of active app then tap on this option. It removes updates of active app from your Android device. Disable: If you don’t want to run this app in your Android device then tap on the Disable option. After that pre-installed app transfer from running app to disable app sections. Clear Data: If you want to remove all data which is related to pre-installed app from your Android device then tap on Clear Data option. 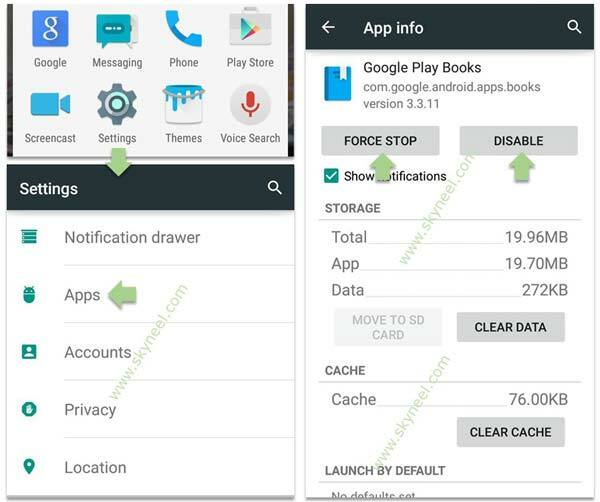 Clear Cache: This option is used to remove all cache of active pre-installed app from your Android device. Note: If you want to recover any disable bloatware in your Android device. Then tap on the “Disabled” option in the Apps window. Open the required disabled app which you want to enable and tap on the “Enable” option. I hope you like this article. After reading this article you will be able to know how to remove or disable bloatware on Android devices. These few small things keep in mind which not only improve life your smartphone but also increase the speed of your Android device. Kindly share your knowledge with your friends, family members and others. Thanks to all.